Oscar-Claude Monet (November 14, 1840 – December 5, 1926) was a French painter, and a leading artist in French Impressionist art movement. Impressionism expresses one's perceptions before nature, especially as applied to plein-air landscape painting. 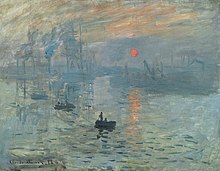 The term "Impressionism" was derived from the title of Monet's painting Impression, soleil levant (Impression, Sunrise) which was exhibited in 1874 in the first of the independent exhibitions mounted by Monet and his associates as an alternative to the Salon de Paris. Monet, 1874: 'Bridge in Argenteuil / Le Pont routier, Argenteuil', oil-painting on canvas; current location: National Gallery of Art Washington D.C.
Monet, 1885: 'The Cliff of Aval, Etrétat', oil-painting on canvas; current location: Israel Museum Jerusalem - quote of Monet about painting beneath the cliffs and a wild sea, 1884: 'I didn't see a huge wave coming; it threw me against the cliff and I was tossed about in its wake along with all my materials! My immediate thought was that I was done for, as the water dragged me down, but in the end I managed to clamber out on all fours.. I am surrounded by a small group of young landscapists who will be very happy get to know you. Besides, they are real painters... I find myself very well fixed here. I am drawing figures at hard. And at the Academy, there are only landscapists. They begin to perceive that it's a good thing. Among Troyon's paintings there are two huge ones; Return to the Farm is marvelous with its beautiful stormy sky. There is much windy motion in the clouds, and the cows and dogs are very good. In Going to the Market you see the mist at sunrise. It's superb and, most of all, very luminous. The wide space in View from Surennes is amazing. You feel you are really in the countryside. Monet wrote Boudin this letter just after he visited the 1859 Salon. It is beautiful here [in Etretat, Normandy], my friend; every day I discover even more beautiful things. It is intoxicating me, and I want to paint it all - my head is bursting.. ..I want to fight, scratch it off, start again, because I start to see and understand. I seems to me as if I can see nature and I can catch it all.. ..it is by observation and reflection that I discover how. That is what we are working on, continuously..
My dear Frédéric Bazille, I ask myself what you can be doing in Paris during fine weather, for I suppose that it must also be very fine there. Here my dear fellow, it is is charming, and I discover every day always beautiful things. It is enough to become mad [fou], so much do I have the desire to do it all, my head is cracking. Damn it, here it is the sixteenth, put aside your cliques and your claques, and come spend a couple of weeks here, it would be the best thing that you could do, because in Paris it cannot be very easy to work. This very day, I still have a month to stay in Honfleur; furthermore my sketches are becoming finished, I have even set to work additionally [remis] on some others. In sum, I am content enough with my stay here, even though my studies are very far from what I would wish. It is decidedly frightfully difficult to make something complete in all respects, and I think that there are scarcely any but those who content themselves with the approximate. Very well, my dear fellow, I want to struggle, scrape, start over again [recommencer], because one can do what one sees and understands, and it seems to me, when I see nature, that I am going to do it all, write it all out, but them go try to do it.. ..when one is on the job..
All this proves that one must only think about this. It is by force of observation and reflection that one finds. So let us grind away and grind away constantly. Are you making any progress? Yes, I am sure of it, but what I am sure of is that you do not work enough and not in the right way. It is not with carefree guys like your Villa and others that you will be able to work. It would be better all alone, and yet, all alone there are plenty of things that one cannot make out. In the end all of this is terrible, and it is a rough task. .. .It is frightening what I see in my head. There at the moment in Honfleur.. .Boudin and Jongkind are here; we get on marvelously. There's lots to be learned and nature begins to grow beautiful.. .I shall tell you I'm sending a flower picture to the exhibition at Rouen; there are very beautiful flowers at present. One is too taken up with all that one sees and hears in Paris, however strong one is, and what I do here will at least have the merit of being unlike anyone else, at least I believe so, because it will simply be the expression of what I, and only I have felt. The further I get, the more I regret how little I know, that's what hinders me the most.. .I don't think I will spend much time in Paris now, a month at the very most, each year. in a letter to Frédéric Bazille; as quoted in: K.E. Sullivan. Monet: Discovering Art, Brockhampton press, London (2004), p. 31. [Chopping wood] is harder than you think, and I'll bet that you would not split much wood.. .All the same, I have probably not reached the end of my troubles. Here is winter at hand, a season not very pleasant for the wretched. Then comes the Salon. Alas! I still won't be in it, for I shall have done nothing. I have a dream a picture of the bathing spot at the Grenouillere, for which I've made a few poor sketches, but it is a dream. Renoir, who has just spent two months here, also wants to do this painting. Zaandam is particularly remarkable and there is enough here to paint for a life-time. My dear Pissarro, Forgive me for not answering your first letter earlier, but I 'm starting to work full steam ahead and have hardly any time. I received your second letter this morning and I see that you are going to great pains on my behalf and getting nowhere: I'm sorry to be giving you so much trouble; so drop the whole thing, and I'll ask Durand-Ruel if he could see to it for me, he might be able to get rid of these damn frames. There are the most amusing things everywhere [in The Netherlands]. Houses of every colour, hundreds of windmills and enchanting boats, extremely friendly Dutchmen who almost all speak French... .I have not had time to visit the museums, I wish to work first of all and I'll treat myself to that later. A group of painters assembled in my home, read with pleasure the article you published in 'L'Avenir national'. We are all very pleased to see you defend ideas which are also ours, and we hope that, as you say, 'L'Avenir national' will kindly lend us its support when the Society we are in the process of forming is finally established. I've got it.. .the Saint Lazare [train-station in Paris, then]. I'll show it just as the trains are starting, with smoke from the engines so thick you can hardly see a thing. It's a fascinating sight, a real dream. I'll get them [the station office] to delay the train for Rouen for half an hour. The light will be better then. My dear Hoschedé, I do not know if in Paris it is the same weather as here, it is probable and so you will be able to understand my discouragement. I am heartbroken, and I absolutely must share with you all my disillusionment; for nearly two months, I have given myself a lot of trouble without result. You do not believe it perhaps, but it is so: I have not lost an hour and would have reproached myself to have taken even a day to come see our exhibition, just out of the fear of losing a single good painting session, an hour of sun. I alone can know my anxieties and the trouble that I give myself to finish canvases that don't even satisfy me and please so few people. In a word, I am absolutely discouraged, not seeing, not hoping in any future.. .I feel all too well the void that is being made around me and the impossibility of facing up to my part of our expenses if we were to continue living together.. .I see everything in black, in pain.. .Please believe all the sorrow that I have in causing you trouble. [looking at the dead body of his first wife Camille, 5 Sept 1879], watching her tragic forehead, almost mechanically observing the colors which death was imposing on her rigid face. Blue. Blue, yellows, grey, what do I know?.. .How natural to to want to reproduce the last image of her, who was leaving us for ever.But even before the idea came to me to record her beloved features, something in me automatically responded tot the shocks of colours. I just seem to be compelled in an unconsciousness activity, the one I engage in every day, like an animal turning in its mill. I am absolutely sickened with and demoralized by this life, I've been leading for so long. When you get to my age, there is nothing more to look forward to. Unhappy we are, unhappy we'll stay. Each day brings its tribulations and each day difficulties arise.. .So I'm giving up the struggle once and for all, abandoning all hope of success.. .I hear my friends are preparing another exhibition this year [the Impressionists, in Paris, 1880] but I'm ruling out the possibility of participating in it, as I just don't have anything worth showing. I can't hold out any longer and am in a state of utter despair. After a few days of good weather, it's raining again and once again I have had to put the studies I started to one side. It's driving me to distraction and the unfortunate thing is that I take it out on my poor paintings. I destroyed a large picture of flowers which I'd just done along with three or four paintings which I not only scraped down but slashed. This is absurd.. .Please be kind enough to have some money forwarded to me. The sea is superb, but the cliffs don't match up to those at Fecamp. Here I'll be certain to do more boats. I won't be here long, I am working as hard as I can, as I told you [in a letter] yesterday, I am very happy to be here Etretat, Normandy] and I hope to come up with something good, in any case I will bring lots of studies back with me so I can work on some big things at home. Once settled, I hope to produce masterpieces, because I like the countryside very much. I insist upon 'doing it alone'. Much as I enjoyed making the trip there with Renoir as a tourist, I'd find it hard to work there together. I have always worked better alone and from my own impressions.. .If he Renoir knew I was about to go, Renoir would doubtless want to join me and that would be equally disastrous for both of us. These palms are driving me crazy; the motifs are extremely difficult to seize, to put on canvas; it's so bushy everywhere, although delightful to the eye.. .I would like to do orange and lemon trees silhouetted against the blue sea, but cannot find them as I would like. I climb up, go down again, then climb up once more; between all my studies, as a relaxation I explore every footpath, always curious to see something new. I hired a good carriage and had myself driven to Menton, a delightful outing of several hours. Menton is wonderful and is in a splendid setting. I walked to Cap Martin, a famous spot between Menton and Monte Carlo. I saw two motifs there that I want to paint because they are so different from things here, where the sea plays no big part in my studies, where the sea plays no big plays no big part in my studies. [While working beneath the cliff at Manneport, Normandy] I didn't see a huge wave coming; it threw me against the cliff and I was tossed about in its wake along with all my materials! My immediate thought was that I was done for, as the water dragged me down, but in the end I managed to clamber out on all fours, but Lord, what a state I was in! My boots, my thick stockings and my coat were soaked through. The palette which I had kept a grip on had been knocked over my face and my beard was covered in blue, yellow etc. But anyway, now the excitement is passed and no harm's done, the worst of it was that I lost my painting which was very soon broken up, along with my easel, bag etc. Impossible to fish anything out. Besides, everything was torn to shreds by the sea, that "old hag" as you sister calls her. I am weary, having worked without a break all day; how beautiful it is here, to be sure, but how difficult to paint! I can see what I want to do quite clearly but I'm not there yet. It's so clear and pure in its pink and blues that the slightest misjudged stroke looks like a smudge of dirt.. .I have fourteen canvases underway. Did you know that I went to London to see Whistler and that I spent about twelve days, very impressed by London and also by Whistler, who is a great artist; moreover, he could not have been more charming to me, and has invited me to exhibit at his show. I am distressed, almost discouraged, and fatigued to the point of slightly ill.. .Never have I been so unlucky with the weather. Never three suitable days in succession, so I have to be always making changes [in his paintings] for everything is growing and turning green. And I have dreamed of painting the Creuse [river in the South of France] just as we saw it.. .In short, by dint of changes I am following Nature without being able to grasp her, and then there is that river that shrinks, swells again, green one day, then yellow, sometimes almost dry, and which tomorrow will be a torrent, after the terrible rain that is falling at the moment. In fact, I am very worried. Write to me; I have a great need of comfort. I have gone back to some things that can't possibly be done: water, with weeds waving at the bottom. It is a wonderful sight, but it drives one to crazy to try to paint it. But that is the kind of thing I am always a tackling. I am in a very black mood and profoundly disgusted with painting. It really is a continual torture! Don't expect to see anything new, the little I did manage to do has been destroyed, scraped off, or torn up. You've no idea what appalling weather we've had continuously these two past months. When you're trying to convey the weather, the atmosphere and the general mood, it's enough to make you mad with rage. For me, a landscape does not exist in its own right, since its appearance changes at every moment; but the surrounding atmosphere brings it to life - the air and the light which vary continually. For me, it is only the, surrounding atmosphere which gives subjects their true value. You know the affection I have always had for you Boudin and also the gratitude. I have never forgotten that you were the first who taught me to see and to comprehend. I am working as hard as I possibly can, and do not even dream of doing anything except the cathedral. It is an immense task. I tell myself that anyone who says he has finished a canvas is terribly arrogant. Finished means complete, perfect, and I toil away without making any progress, searching, fumbling around, without achieving anything much. I hope that Cezanne will still be here and that he will join us, but he is so shy, so afraid of meeting new people, that I am afraid that he might let us down, even though he wants very much to meet you. How sad it is that this man hasn't had more patronage in his life! This is a true artist who has come to doubt himself far too much. He needs to be cheered up, so e was quote touched by your article. I have at last found a suitable spot and settled her. I have already spend a few days working and started eight canvases, which I hope, if the weather favours me, will give an idea of Norway and the environs of Christiania.. .This morning I was painting under constant falling snow. You would have burst out laughing seeing me white all over, my beard overgrown with icicles. One should live here for a year in order to accomplish something of value, and that is only after having seen and gotten to know the country. I painted today, a part of the day, in the snow, which falls endlessly. You would have laughed if you could have seen me completely white, with icicles hanging from my beard like stalactites. To me the motif itself is an insignificant factor; what I want to reproduce is what lies between the motif and me.. .Other painters paint a bridge, a house, a boat.. .I want to paint the air in which the bridge, the house and the boat are to be found - the beauty of the air around them, and that is nothing less than the impossible. Claude Monet, in an interview, 1895; as quoted in: Paul Hayes Tucker et al. (eds). (1999) Monet in the Twentieth Century. London: Royal Academy of Arts/Boston: Museum of Fine Arts. As cited in: Steven Connor, "About There, or Thereabouts." talk given at the Catalysis conference on Space and Time, Downing College, Cambridge, 23rd March 2013. Ninety percent of the theory of Impressionist painting is in.. ..Ruskin's Elements. I've never seen such changeable conditions and I had over 15 canvases under way, going from one to the other and back again, and it was never quite right; a few unfortunate brushstrokes and in the end I lost my nerve and in a temper I packed everything away in crates with no further desire to look out of the window, knowing full well that in this mood I'd only mess things up and all the paintings I'd done were awful, and perhaps they are, more than I suppose. I could not appreciate his [ Boudin ] paintings and when he offered to take me with him to paint outdoors in the open countryside, I always found a pretext and refused politely. But when summer came, I was more or less free to dispose of my time as I wished and I had no feasible excuse left to give him and gave in. Thus it was, that Boudin - with his inexhaustible kindness - took it upon himself to educate me. With time, my eyes began to open and I really started to understand nature. I also learned to love it. I would analyze its forms with my pencil. I would study its colorations. Did not Troyon tell me to enter the studio of Couture [in Paris]? It is needless to tell you how decided was my refusal to do so. I admit even that it cooled me, temporarily at least, in my esteem and admiration of Troyon.. ..and [I] after all, connected myself only with artists who were seeking. The following week, when he Toulmouche passed in front of me, he sat down and squarely positioned on my chair, looked at my piece. I could then see him turn around, inclining his serious face with a satisfied air and I heard him say to me while smiling: "Not bad, not at all bad this, but it is too much like the real model. You have a stocky man and you depict him as stocky.. .Nature, my friend, serves well as a means to study but offers no real interest. Style is the only thing that matters." I was flabbergasted. The truth, life, nature - all that provoked emotions in me - all that constituted for me the real essence and the unique "raison d'être" of art, did not exist for this man! Quote from Claude Monet par lui-meme – an interview by Thiébault-Sisson / translated by Louise McGlone Jacot-Descombes; published in 'Le Temps newspaper', 26 November 1900. Jongkind.. ..his painting was too new and far too artistic to be appreciated in 1862 at his prices. Moreover, no one was as bad at making himself valued, as he was. He was a straight-forward and simple kind of man, who could hardly speak bad French and was very shy. But he was very outgoing that day. He asked to see my sketches, invited me to come and work with him, explained the whys and wherefores underlining his work and thereby, completed the training that I had already received from Boudin. He became from this moment my true master and it [is] to him, that I owe the definitive training of my eyes. about Johan Jongkind, famous pre-impressionist landscape-painter of Dutch origin, painting then in Honfleur for some years and advising Monet then. It was not until 1869 that I met him Manet again, but this time, we became friends immediately. From the first meeting, he invited me to join him every evening in a café of the 'Batignolles' where he and his friends would gather to talk at the end of a day spent at their studios. I would meet there, Fantin-Latour and Cézanne, Degas - who arrived shortly afterwards from Italy, the art critic Duranty, Emile Zola who was just starting-off in the literary world and a number of others. I would take Sisley, Bazille and Renoir. There was nothing more interesting than these discussions with their perpetual differences of opinion. Our mind and souls were stimulated.. .One would always leave, all the better immersed, the will stronger, our thinking more defined and clear. about Édouard Manet, leading artist in Impressionism then, in Paris. ..but what a pity that I did not come here [in Venice] when I was younger and more adventurous. It's quite beyond my powers at my age, and yet I want to succeed in expressing what I feel. Since the appearance of Impressionism, the official salons, which used to be brown, have become blue, green, and red.. .But peppermint or chocolate, they are still confections. Nothing in the whole world is of interest to me but my painting and my flowers. Colours no longer looked as brilliant to me as they use to do [Monet's sight was beginning to fail], I no longer painted shades of light so correctly. Reds looked muddy to me, pinks insipid, and the intermediate or lower notes in the colour scale escaped me. As for forms, I could see them as clear as ever, and render them as decisively. At first I tried pertinacity. How many times I have remained for hours near the little bridge, exactly were we are now, in the full glare of the sun, sitting on my camp-stool, under my sunshade, forcing myself to resume my interrupted task and to recapture the freshness my palette had lost! A waste of effort. What I painted was more and more mellow.. ..and (when) I compared it with what I used to do in the old days. I would fall into a frantic rage, and I slashed all my pictures with my penknife. Though I remained insensitive to the subtleties and delicate gradations of colour.. ..my eyes at least did not deceive me when I drew back and looked at the subject in its broad lines, and this was the starting-point of new compositions.. .Slowly I tried my strength in innumerable rough sketches which convinced me.. .I could see as clearly as ever when it came to vivid colours isolated in a mass of dark tones. How was I to put this to use? My intentions gradually became clearer.. .I said to myself, as I made my sketches, that a series of general impressions, captured at the times of day when I had the best chance of seeing correctly, would not be without interest. I waited for the idea to consolidate, for the grouping and composition of the themes to settle themselves in my brain little by little, of their own accord; and the day when I felt I held enough cards to be able to try my luck with a real hope of success, I determined to pass to action, and did so. I'm very sorry to inconvenience you [ the art dealers G. and J. Berheim-Jeune ], but I find it impossible to supply you with any more Venice pictures. It was useless trying to persuade my self otherwise, the work that's left is too poor for exhibition. Don't insist.. .I've enough good sense in me to know whether what I'm doing is good or bad, and it' utterly bad, and I can't believe that people of taste, if they have any knowledge at all, could see any value in it. Things have been dragging on like this for far too long.. I can no longer work outside because of the intensity of the light. I see less and less.. .I need to avoid lateral light, which darkens my colors. Nevertheless, I always paint at the times of day most propitious for me, as long as my paint tubes and brushes are not mixed up.. ..I will paint almost blind, as Beethoven composed completely deaf. Quote, Jan. 1921, to journalist Marcel Pays. Monet in the 20th Century, by Paul Hayes Tucker. It took me a long time to understand my water lilies.. .I planted them for pleasure, and grew them without thinking of painting them.. You don't absorb a landscape in a day.. .And then, all of a sudden, I had the revelation of the enchantment of my pond. I took up my palette. As quoted in Claude Monet: Les Nymphéas (1926) by Georges Clemenceau, Ch. 2. My only merit lies in having painted directly in front of nature, seeking to render my impressions of the most fleeting effects, and I still very much regret having caused the naming of a group whose majority had nothing impressionist about it. Quote in his letter to Evan Charteris, June 21, 1926; as cited in: Levine, Steven Z. "Monet's Series: Repetition, Obsession." October (1986): 65-75. Quote of Monet; as cited in Stephen Lucius Gwynn Claude Monet and His Garden: The Story of an Artist's Paradise, Macmillan, 1934, p. 69: Comment by Monet to the English biographer Sir Evan Charteris. I was born undisciplined. Never, even as a child, could I be made to obey a set rule. What little I know I learned at home. School was always like a prison to me, I could never bring myself to stay there, even four hours a day, when the sun was shining and the sea was so tempting, and it was such fun scrambling over cliffs and paddling in the shallows. Such, to the great despair of my parents, was the unruly but healthy life I lived until I was fourteen or fifteen. In the meantime I somehow picked up the rudiments of reading, writing and arithmetic, with a smattering of spelling. And there my schooling ended. It never worried me very much because I always had plenty of amusements on the side. I doodled in the margins of my books, I decorated our blue copy paper with ultra-fantastic drawings, and I drew the faces and profiles of my schoolmasters as outrageously as I could, distorting them out of all recognition. I didn't become one.. .As long as I can remember I've always been one. Monet answering the question, how he had became an impressionist. I felt the need, in order to widen my field of observation and to refresh my vision in front of new sights, to take myself away for a while from the area where I was living, and to make some trips lasting several weeks in Normandy, Brittany and elsewhere..
One day Eugène Boudin said to me, '..appreciate the sea, the light, the blue sky'. I took his advice and together we went on long outings during which I painted constantly from nature. This was how I came to understand nature and learned to love it passionately. I'm half an hour late, I'll come back tomorrow. [about his friend Monet, in 1865] ..hard at work for some time now. His paintings has really progressed, I'm sure it will attract a lot of attention. He has sold thousands of franc's worth of paintings in the last few days, and has one or two other small commissions. He's definitely on his way. Frédéric Bazille, letter to his brother, Dec. 1865; as cited in The private lives of the Impressionists, Sue Roe, Harpen Collins Publishers, New York 2006, p. 43. I said to him [to Monet, when Degas saw in 1866 for the first time Monet's landscape paintings]: 'I am off, all these 'reflets d'eaux' are making my eyes hurt'.. ..It was full of draughts; a few more and I'd have pulled the collar of my jacket up. Edgar Degas, 1866, from The private lives of the Impressionists, Sue Roe, Harpen Collins Publishers, New York 2006, p. 45. Frédéric Bazille, letter to Monet, Jan. 1867, who accused Bazille of cheating with the price of the painting; as quoted in, Monet and His Muse: Camille Monet in the Artist's Life, Mary Mathews Gedo; University of Chicago Press, 2010, p 72. Édouard Manet (1875), letter to Paris' art-critic Duret; as cited in Letters of the great artists – from Blake to Pollock -, Richard Friedenthal, Thames and Hudson, London, 1963, p. 121. I received a letter from Monet, who is in despair because he has not succeeded with the canvases on which he worked most furiously, as happened with those I did at Gisors. - My work is going better, but I am only beginning. Camille Pissarro, letter to his son Lucien, Eragny, 25 August 1885; as cited in Camille Pissarro - Letters to His Son Lucien ed. John Rewald, with assistance of Lucien Pissarro; from the unpublished French letters; Tr., Lionel Abel; Pantheon Books Inc. New York, second edition, 1943, p. 62. Camille Pissarro, letter to his son Lucien, Paris, 9 Jan. 1887; in Camille Pissarro - Letters to His Son Lucien ed. John Rewald, with assistance of Lucien Pissarro; from the unpublished French letters; Tr., Lionel Abel; Pantheon Books Inc. New York, second edition, 1943, p. 91. 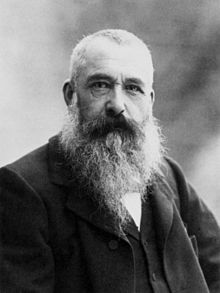 I say this: Monet plays his salesman's game, and it serves him; but it is not in my character to do likewise, nor is it to my interest, and it would be in contradiction above all to my conception of art. I am not a romantic! I would really have no raison d'etre, if I did not pursue a considered technique which yet leaves me free to express myself, and does not inhibit an artist who has the gift. Camille Pissarro, letter to his son Lucien, Paris, 9 Jan. 1887; in Camille Pissarro - Letters to His Son Lucien ed. John Rewald, with assistance of Lucien Pissarro; from the unpublished French letters; Tr., Lionel Abel; Pantheon Books Inc. New York, second edition, 1943, p. 92. ..tell me whether she [Pissarro's wife] did not find Monet's things a little too dark? [Monet's paintings at the Paris exhibition, at M. Petit, May 1887]. I do not know whether I am correct in this, but these works seem to me to lack luminosity, by which I mean the light that bathes bodies in the shade as well as those in the sun. The effect is certainly decorative, but there is little finesse and crudities are prominent; I do not know if it belongs to our vision which aspires to harmony and demands an art which while not decoration is yet decorative. Camille Pissarro, letter to his son Lucien, Paris, 14 May 1887; in Camille Pissarro - Letters to His Son Lucien ed. John Rewald, with assistance of Lucien Pissarro; from the unpublished French letters; Tr., Lionel Abel; Pantheon Books Inc. New York, second edition, 1943, p. 108. He [ Bracquemond ] also noted the crude execution in some of the Monet's [paintings at the Paris Impressionism-exhibition at M. Petit, May 1887], particularly in one of the Holland canvases [Monet painted them in May 1876], in which the impasto is so thick that an unnatural light is added to the canvas, you can hardly conceive how objectionable it is to me, - even worse is the swept and meager sky - no, I [ Camille Pissarro ] cannot accept this approach to art. - But the walls in the picture seem to me very well treated. Camille Pissarro, letter to his son Lucien, Paris, 15 May 1887; in Camille Pissarro - Letters to His Son Lucien ed. John Rewald, with assistance of Lucien Pissarro; from the unpublished French letters; Tr., Lionel Abel; Pantheon Books Inc. New York, second edition, 1943, p. 110. But what an eye Monet has, the most prodigious eye since painting began! I raise my hat to him. As for Courbet, he already had the image in his eye, ready-made. Monet used to visit him [Courbet], you know, in his early days.. ..But a touch of green, believe me, is enough to give us a landscape, just as a flesh tone will translate a face for us..
Paul Cézanne, 'What he told me – I. The motif' in Joachim Gasquet's Cézanne, - a Memoir with Conversations, (1897 - 1906); Thames and Hudson, London 1991 p. 164. Monet's cliffs (in Etretat) will survive as a prodigious series, as will a hundred others of his canvases.. ..He'll be in the Louvre, for sure, alongside Constable and Turner. Damn it, he's even greater. He painted the iridescence of the earth. He's painted water. Remember those Rouen cathedrals (series of paintings of Monet of the Cathedral of Rouen).. .But where everything slips away in these pictures of Monet's, nowadays we must insert a solidity, a framework..
Paul Cézanne, 'What he told me – I. The motif' in Joachim Gasquet's Cézanne, - a Memoir with Conversations, (1897 - 1906); Thames and Hudson, London 1991 p. 165. This is a bad moment for me, Durand doesn't take my paintings. 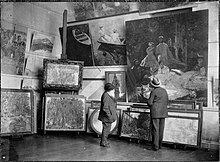 Miss Cassatt was much surprised to hear that he no longer buys my work, it seems that he sells a great deal. - But for the moment people want nothing but 'Monet's', apparently he can't paint enough pictures to meet the demand. Worst of all they all want 'Sheaves in the Setting Sun'! always the same story, everything he does goes to America at prices of four, five and six thousand francs. All this comes, as Durand remarked to me, from not shocking the collectors! Camille Pissarro, letter to his son from Paris, 3 April 1891, in Camille Pissarro - Letters to His Son Lucien ed. John Rewald, with assistance of Lucien Pissarro; from the unpublished French letters; Tr., Lionel Abel; Pantheon Books Inc. New York, second edition, 1943, p. 159. I saw George de Bellio yesterday; he sends you [Pissarro's son Lucien] his best. He mentioned that Monet was going to have a one-man show at Durand-Ruel's, and exhibit nothing but Sheaves. The clerk at Boussod & Valadon told me that the collectors want only Sheaves. I don't understand how Monet can submit to this demand that he repeat himself — such is the terrible consequence of success! It happens all the time! Camille Pissarro, letter to his son from Paris, 13 April 1891, in Camille Pissarro - Letters to His Son Lucien ed. John Rewald, with assistance of Lucien Pissarro; from the unpublished French letters; Tr., Lionel Abel; Pantheon Books Inc. New York, second edition, 1943, p. 161. Unfortunately, the realization of my sensations is always a very painful process with me. I can't seem to express the intensity which beats in upon my senses. I haven’t at my command the magnificent richness of color which enlivens Nature.. .Look at that cloud; I should like to be able to paint that! Monet could. He had muscle. Paul Cézanne, in a conversation with Vollard, along the river near Aix de Provence, 1896, as quoted in Cezanne, by Ambroise Vollard, Dover publications Inc. New York, 1984, p. 74. * I thought that the painter had no right to paint so un-clearly.. ..(but) the first faint doubt as to the importance of an 'object' as the necessary element in painting.. [ Kandinsky is remembering here his early experience when he saw one of the 'Haystack' paintings of Monet for the first time in his life, in Moscow, c. 1895]. Wassily Kandinsky, Autobiography, 1918; as cited by Kandinsky, Frank Whitford, Paul Hamlyn Ltd, London 1967, p. 10. The Bridge at Argenteuil... is one of the best examples of early mature Impressionism, in which the brushwork varies according to the image being created: blended mixtures for clear water, choppy aggregates for reflections, wide, dragged horizontals for boat hulls, streaky verticals for masts, finely bunched diagonals and swirls for foliage, curved and irregular dabs for clouds. These different marks are also of varied thickness. The smoother ones for sky and water are so thin as to have negligible substance, but the boats, trees, clouds, and multicolored reflections have substantial impasto. In front of the original painting... the viewer unconsciously lets the thicker strokes confer a fictitious "reality" on their images, compared to the insubstantiality of water and sky. Before Impressionism, painters had varied the direction and texture of their brushwork according to the images they defined, but for Monet these manipulations... were even more vital, because he had renounced the traditional underpinnings of modeling in light and dark. ...[T]he representation of leisure was the result of hard work. Robert L. Herbert, Impressionism: Art, Leisure, and Parisian Society (1988) p. 244-245. Giorgio Morandi, as quoted in E. Roditi, Giorgio Morandi, p. 63. At Argenteuil [where Monet had built a little wooden cabin on his studio-boat], [Renoir] and Monet resumed their old habit of painting the same views, seated side by side. Life was beginning to change for the better; 1872 seemed to be a year not only for recovery [from the war years] but also for putting down roots. This page was last edited on 14 January 2019, at 22:44.